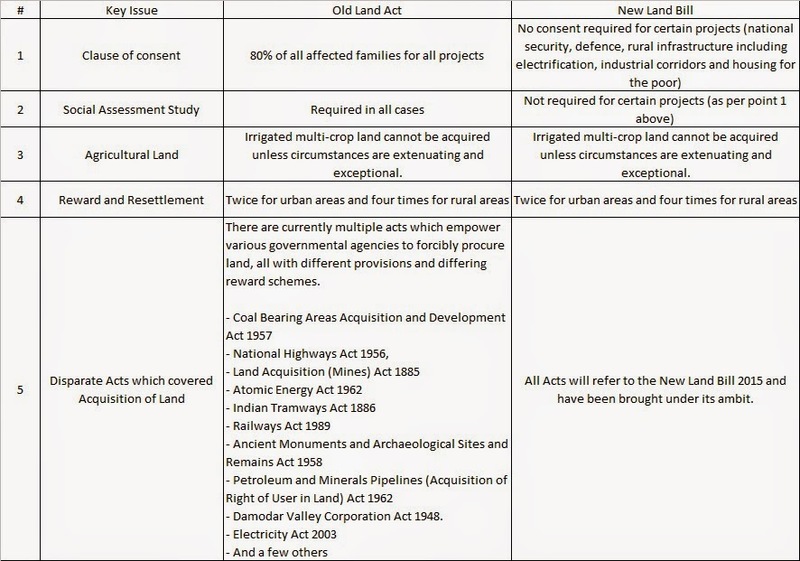 One Small Voice: The Land Acquisition Act . . Are we asking the right questions? 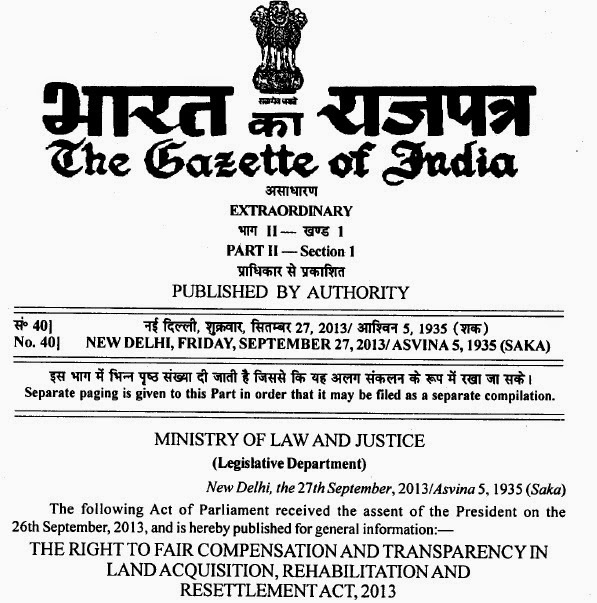 What is the Land Acquisition Act? What's all the ruckus about? Which are the sections creating the conflict? So I tried to find out. And here's what I have pieced together. Let's start with the history of this bill and how it came about. Since I have a tendency to ramble, I shall try to keep this as succint as possible. The Land Acquisition Act is also called "The Right to Fair Compensation and Transparency in Land Acquisition, Rehabilitation and Resettlement Act 2013". Quite a mouthful ain't it? Let's call it the Old Land Act from hereforth. This is the bill that the Congress (a minority player now), NCP, Shiv Sena, Akali Dal and other partners within the NDA (and perhaps a lot of the BJP too) want unchanged. it was originally promulgated by the UPA led government in 2011 as a bill and brought into effect as an Act in 2014. 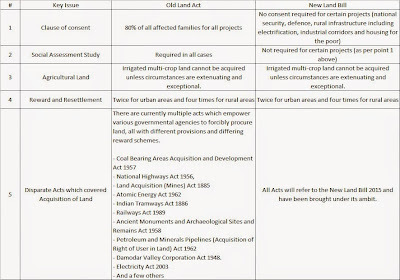 The BJP (a minority within the BJP actually) want to implement/promulgate the New Land Bill 2015 (also called The Right to Fair Compensation and Transparency in Land Acquisition, Rehabilitation and Resettlement (Amendment) Bill 2015). To summarize - we have the Old Land Act 2013 and the New Land bill 2015. The whole brouhaha is about certain sections which govern what activities can land be grabbed from us for, and the nature of the compensation we will get for it. The next contentious issue is enshrined in certain sections of Chapter IV (Notification and Acquisition). This talks about procedural formalities to be followed in order to acquire land. Land was being forcible procured. Then and now. The Old Land Act and the New Land Bill both have this clause. Land will be forcibly taken from us (as long as it is used for public purposes as defined by the act). Old Land Act (OLA) gave an immense opportunity for middle-men and power brokers to earn money and to hold up critical infrastructure projects. Furthermore, the 80% clause meant that politicians could subvert weaker landowners to their will and forcibly acquire pieces of land but not touch their own (since they would similarly be subverting affected families on their own land). The New Land Bill (NLB) seeks to do away with this only for public purpose projects. Land still cannot be acquired for building malls! Even in the OLA, this was not supposed to happen but politicians have subverted the clause of consent and manipulated farmers to meet their own nefarious goals. Both the OLA and the NLB talk about not touching irrigated multi-crop agricultural land unless the circumstances are exceptional (as defined by the act). No changes there. Genuine farmers can breathe easy. This provision is specifically for purposes of food security (and the government rightly said so on the international stage as well. Ties in nicely. I have already expounded in detail on the Food Security Bill and you can read my thoughts here). The NLB does make it easier for land-owners to get their compensation too. Not just the NLB but country-wide initiatives like Jan Dhan Yojana have ensured that all people are brought under the transparent banking ambit and thus middle-men are disposed of when distributing money from the government to the people. I realise that I may lack the legal expertise to weigh the pros and cons of the OLA and the NLB in entirety. Perhaps a lawyer can help me there. I may also lack the holistic world-view that the government and its opposition may have in debating this issue. But I realise that in this day and age, if India has to grow fast, industrialization needs to happen fast. For that to happen, critical infrastructure projects need to be initiated. We need more hospitals, dams, road-works, affordable housing and industries than we need elitist housing like Lavasa, malls, multi-plexes, large amusement parks and such-like. An extension of the toilets first and temples later analogy which Modi made in his election campaign. I also realize the need to break the hold that politicians and land-owners have over the general public. Call it coincidence or a nexus, most politicians in Maharashtra are heavy land-owners. The reason most political parties are opposing the NLB is that most of them are comprised of politicians/land-owners (the line is very thin) and they will be hardest hit if the NLB does see the light of day (this viewpoint has been elucidated in further detail here). However, I also comprehend the view that Hazare and his kin take - that how will the government ensure fair resettlement and rehabilitation? What if tomorrow Modi is not around to ensure transparency and honesty? What if the same bill that is going to be used today for a good cause is subverted through some means tomorrow (not sure how yet) for the same people that it seeks to eliminate from the current power structure? Valid questions I think . .
What I am trying to say is; instead of the two current stands that most people are taking - berate the government or repudiate this by saying Modi is god, we ought to understand the issues at hand. We need to comprehend what the law seeks to do and weigh the advantages it seeks to bring in with possible disadvantages from a socialist view-point. It needs to be an educated discussion and not a mud-slinging match even in our daily conversations and thoughts. How are we different from the politicians if we do the same thing they are doing and yet walk away with self-righeousness and talk of societal change? We need to rise above the rabble and think about the actual pros and cons from a process-design perspective. That is the hallmark of an enlightened citizen and a responsiblity that we owe to our own conscience as Indians.